Toshiba Group takes full advantage of know-how cultivated in over 140 years of experience in the social infrastructure business and manufacturing, and of expertise gained from a wide range of industries and worksites. 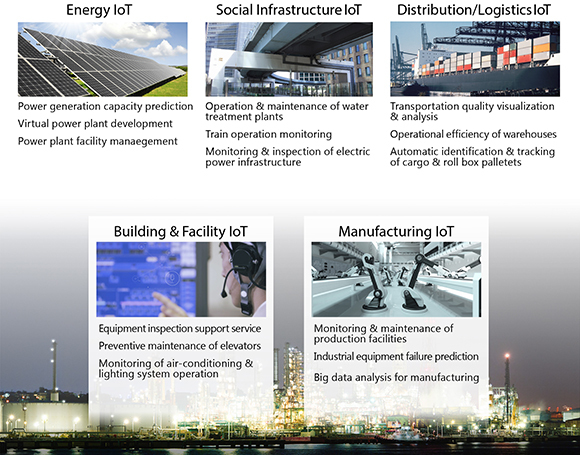 We combine these with our latest advances in IoT and AI, and co-create new value propositions with our customers in industry and with society. We have devoted years of effort to the development of AI technologies and to promoting "Toshiba Communication AI RECAIUS" and "Toshiba Analytics AI SATLYS". Our aim is not only to connect things but also to develop a deep and comprehensive understanding of human intentions and situations that brings a new level of understanding to communications between people and machines. We will continue to contribute to creating a comfortable and safer society for people worldwide, to apply our latest digital technologies to business transformations, and to promote Co-Creation that enables open innovations that extend far beyond the boundaries of companies, industries and regions.